Sometimes, you just don’t need the real thing. Maybe you are looking to go on a vacation, and just want a couple of bands that look the part, but don’t want to risk your cherished valuables. Perhaps you are on a budget, and are looking to get starter rings. No matter what the case is – Ring Ninja has some options that are not only extremely durable, but also extremely affordable. These options are not only amazingly durable, but they can be personalized as well to give you a ring that isn’t just cheap – but a ring that is also truly unique! 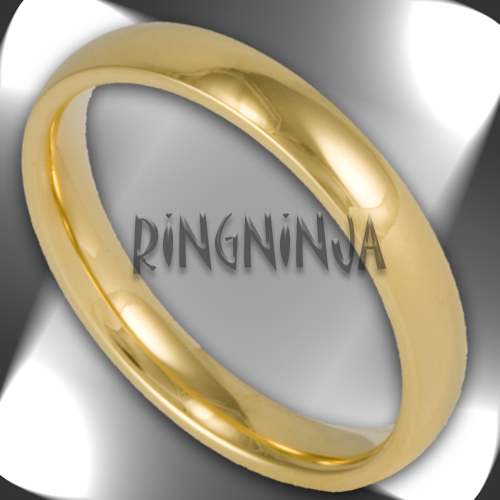 Ring Ninja’s newly release Classic Domed Gold Plated Stainless Steel rings are available in both 3MM and 6MM widths at the time of writing this. Both rings are made of durable stainless steel – and are in the timeless style of our classic domed rings. These rings can both be engraved inside, and the 6MM ring can be engraved outside. They both look great being engraved on the outside with Ring Ninja’s outside laser engraving service. The 3MM ring can be engraved via our traditional engraving service on the outside as well, although to avoid any issues it needs to be requested. This can be done via a simple email. So if you are looking for the ultimate cheap wedding ring, go with one of our two stainless steel gold plated rings. Not only are these rings attractive, but they have a great price, and can be personalized to make these rings uniquely yours! Two hearts – still intertwined. Great engraving idea!